The Temazcal steam bath is one of the oldest and most effective purification rituals in the world. In ancient Mesoamerican tradition, Temazcal offered the chance to be reborn and reinvent oneself via invocation, chanting as well as purification. The luxurious El Dorado Casitas Royale and El Dorado Seaside Suites by Karisma in Riviera Maya, Mexico are part of the premier hotel collection of adults-only properties throughout the Riviera Maya, Mexico. If you want to detox your body, mind and spirit in a traditional, Temazcal steam bath service, then indulge yourself at the N’aay Spa. 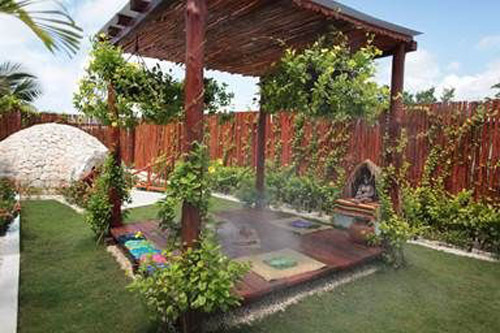 The goal of a Temazcal steam bath is to provide a calming and therapeutic experience with numerous physical benefits. A few are cleaning the body of toxins, purification of the respiratory system, and the alleviation of skin and nervous system conditions. Temazcal Ritual sessions at N’aay Spa occur inside a round earthen structure that is meant to symbolize the womb of mother earth. Inside, you will find the elements of water, fire, and air which are combined together with fresh herbs to create an authentic herbal steam bath experience which invites both physical and spiritual healing. A N’aay Spa spa attendant will facilitate each Temezcal Ritual session and will adjust the heat, humidity, and herbal vapors as needed, to meet spa customer’s individual needs. * Golden Elements Couples Grand Experience: Enjoy a couple’s massage performed with a massage cream infused with citrus and ginger, followed by a Jacuzzi session with an elixir of bamboo ending in a detoxification Temezcal Ritual. Amenities include a fruit basket and a glass of sparkling wine. Session: 80 minutes / $260 per couple. * Golden N’aay Couples Grand Experience: Revel in the Kukulcan massage, a creation of ancient techniques that shall give your body profound relaxation, accompanied by a bubbling Jacuzzi session using a green tea elixir. Finish the experience with a Temazcal steam bath of eucalyptus essence. Amenities include chocolate fondue with fruits, a glass of sparkling wine and a selection of bites created by our Chef. Session: 120 minutes / $350 per couple. For groups of five or greater, resort guests can purchase the relaxing session for a starting price of only $68 per person. The luxury spa offers a variety of services that are designed in the Mexican tradition. Choose from a menu of indigenous and alternative spa therapies, each utilizing ingredients from the local region. The treatments also include ancient healing to soothe the senses and pamper the body. If you’re ready for a relaxing getaway, consider the gourmet inclusive, El Dorado Casitas Royale and El Dorado Seaside Suites. Be sure to book a relaxing, Temazcal steam bath session at N’aay Spa. Contact The Life of Luxury for all your personal and business travel needs.